The menu background image for Theater in Halo: Reach. Theater is a feature first introduced in Halo 3 that allows player to review their gameplay footage in real-time. Due to the usefulness and popularity of the feature, it has been a staple feature in Halo first-person shooter titles, appearing in Halo 3: ODST, Halo: Reach, Halo 4, Halo: The Master Chief Collection and Halo 5: Guardians. Every time a player plays a game of campaign or multiplayer, the game will automatically be saved into a list of up to twenty-five recent films, which players can watch at their leisure. Players have a number of abilities while in-film; play, pause, fast-forward, take screenshot, rewind and record film clip, however the latter two are only available in multiplayer clips in Halo 3 and Halo 3: ODST, due to loading issues in campaign. Players can save up to one-hundred saved films in Halo 3. Film clips are shorter, recorded sections of a film, only usable in Halo 3 and Halo: Reach, not in Halo 3: ODST. 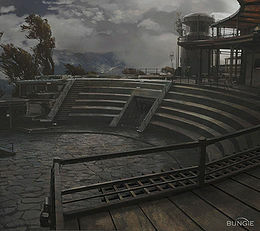 Theater is also featured in Halo: Reach and is improved as "Theater 2.0", with the ability to rewind films in campaign and Firefight. In Halo: Reach, a player can save one thousand items of each file type, including clips, films, maps, and gametypes. In Halo: The Master Chief Collection, the feature is available for Halo 3 and Halo 4. It is also available for Halo 2 Anniversary but is only limited to multiplayer. Pressing "Y" while watching a film will enable players to roam around the space in real-time. Despite popular belief, saved films are only collections of game information readable only through the Xbox 360, thus cannot recorded onto a PC without the use of Bungie Pro film rendering, or a video capture card. Screenshots can be saved to a computer as an actual image if posted from a file share on Halowaypoint.com. This is only relevant to Halo: Reach and Halo 4, as Halo 3 file support was terminated during the move to 343 Industries. Halo Wars has a feature of the same name, though it is just a library of the pre-rendered cutscenes throughout the campaign. Theater can be used to make certain tricks. If one pauses a Theater film while a character is speaking, they will continue to speak until the end of that sentence, and if that character is present at the scene, their mouths will still move, but nothing else will. This can cause a glitch where Truth's hologram will appear, and he will make his speech while one has the game paused, and then when one presses play, he will make gestures that originally sync with the speech, but without saying anything. This is also true for running the video faster or slower than normal speed. Rather than slowing down or speeding up the sound, which would change the pitch, it simply plays the sound whenever it starts. So if the footage is slowed, sounds are spread apart, where if it is sped up the sounds are compressed, with more sounds playing at the same time. This also occurs during gameplay sequences if an character is in mid-vocalization when pausing. This can easily been seen when pausing during an assassination involving Sangheili, as their mandibles will move while the rest of their body is still. Theater has made machinima much easier to produce, as Halo: Combat Evolved and Halo 2 required people to film scenes using the first person perspective of another player in-game. The gametype "Slayer" is replaced with the name "Blam!" in Theater, even though it is the name of a regular gametype. The same goes for "Assault". ↑ Through modifications, it is possible to access Theater mode on campaign gameplay. However, as this requires tampering with the game itself, users will be banned automatically when caught.